When an electric current passes at a right angle to a magnetic field, a force is produced, which moves perpendicular to the magnetic field. Have a look at the diagram below to help you understand this. Put your Index finger in the direction of the current; Middle finger in the direction of the magnetic field; and point your thumb up and it should point in the direction of the force. This phenomenom can be used to produce a rotation in what is called a simple DC motor. This principle is also applied to make dynamos, which are used to generate electricity; this is explained below. 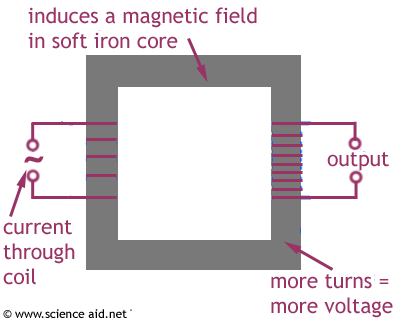 increasing the strength of the magnetic field. This effect may seem boring and useless, but you would not be able to read thid without it. It is used to generate electricity. A magnet is rotated within a wire, thus creating the electricity that powers our homes (and the computer that enables you to read this). 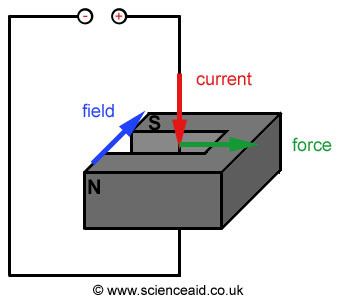 The above diagram shows a step up transformer because it increases the voltage. Step up and step down transformers are used all over the country, for your domestic electricity supply. They change the voltage up and down for the different stages of its transportation: increasing from the power plant to electric cables, decreasing from cables to your home. There is a relationship between the primary (in) and secondary (out) voltages on the transformer depending on the number of turns the wire takes around the magnet.